I got a Sorcery question, and the forums aren't populating today. If I cast normally (not for consequences), can I just roll Sorcery and build my spell based on the difficulty and amount of momentum I generated, or do I have to build the spell before I roll and the momentum spends add to the base difficulty? Also, is Duration a separate spend if I want to increase it? i play sorcery as you pick the level of momentum spends , i feel that your crafting your spell at the exact moment. i also make it very dangerous. each complication allows me to take possession of the sorcerer for one round each. The update contains "Conan_-_Character_Sheet_-_Basic_-_No_background.pdf" which, unfortunately, does have a background. Please provide a character sheet with no background. Also, it would be very helpful to have a "no background" compendium of the essential combat tables. Modiphius released optimized PDFs of the Core Books for the Kickstarter Backers that are about 70 MB on March 31st. Is it possible to update the PDF here as well to the optimized format? It will save a bandwidth and a lot of trouble. Quick question for the publishers/developers. I backed at the PFD Master level after the Kickstarter concluded and have already received the final PDF. Because it's distributed outside DriveThru it obviously isn't on my library here, I can't rate or review. Is there a plan to address this? 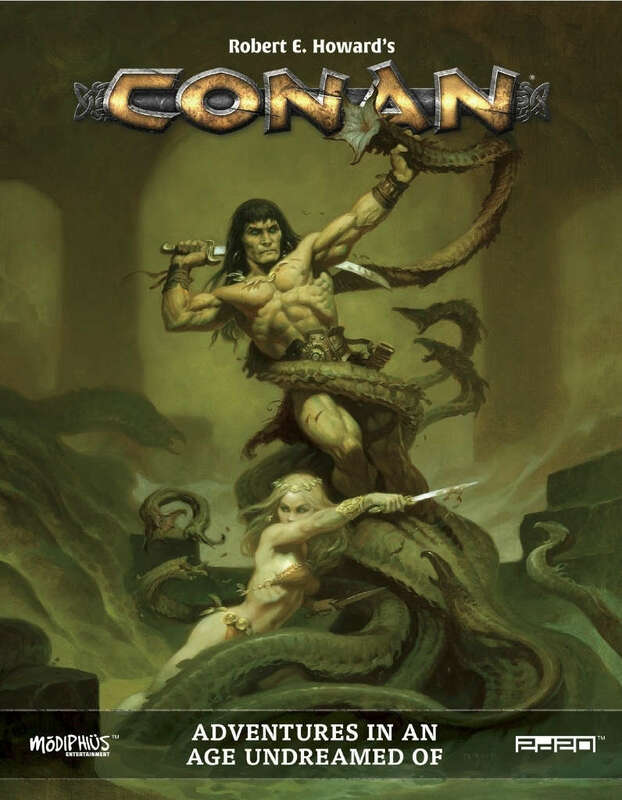 It's a minor issue (after all, I do have the game), but I've been enjoying Conan tremendously and would like to write a review. With that out of the way, my group's already having great times with this system and all the obvious effort that's gone into it! It's an exciting and dynamic pulp-action game, just a ton of fun. Congratulations to everyone involved in its production. I backed the same pledge during the kickstarter. If we want to write a review, we still have option for writing it down here, and phrase our rating for this book.only question is, if there should be any updated version for pdfs, would we get the same advantage as Drivethru/OneBookShelf does? Hi guys, yes backers will be updated via Pledge Manager, once all the pdf's are issued we'll add them to drivethrough accounts as well. We have a complex list of backers for each book which would require a lot of admin which is why we're keeping the books on PledgeManager for now. I would also love to give 5 stars to Conan 2d20. My favorite system. I just peeked, but both this pdf that the rules seem to be great. To me, this is a more simple and light version of the Mutant Chronicles rules, but in a good way. Again: very good work people. I await the paper version to buy. I have two questions. One, is this setting potentially going to be adapted to any other systems? If it goes the way of Mutant Chronicles, that would mean Savage Worlds, and I would like seeing an "official" Conan the Barbarian Savage Worlds setting done, as it is my system of choice. Two, and on the other hand regarding the system changing for the setting, this 2d20 system is rather interesting. Do you think there would be any chance of a "core rules" version of the 2d20 system being published? While I can understand if that is unlikely, a sort of universal version of this system would be most interesting. The lack of such a general framework is why I haven't looked into the Ubiquity System stuff, among other things, and I thing for the system itself, I would be most interested in that. There is no urgency to these questions, I am just curious. Please get back to me if you can. Yes we are planning a system neutral book with a license to let people produce their own games. The two main PDFs are downloading as 11 and 34 MB, neither opens in any of several programs. Whatever you've uploaded here, they aren't good PDFs. That is only a partial download as both are bigger than that. Your connection likely crashed during the download corrupting the file. Try saving to Dropbox direct, download the files separately, or try a faster and/or more stable connection. Hello I'm having issues downloading either the Regular or Printer Friendly Version, for some reason they are just failing to load. It's a big download, so it may be worth trying to download it again or as individual PDFs rather than a bundle as chances of corruption are high. I've tried multiple times on my Laptop and Iphone: on the Laptop any instance of me downloading either the regular version or the printer friendly version ends with a message saying failed to load or the files are damaged. On my Iphone they just crash the page or I end up with a black page at the end. Hi Jory try raising it with DriveThru support, have you tried a different web browser? Will do. I used a couple of browsers and still the same conclusion. Jory B have you try to download on the store page instead your library page? The full version still does not work for me. on computer or ipad. Where are typos being reported? P100, in the belit "queen of the black coast" box; legendry->legend. I can not open the printerfriendly pdf on my tablet. The Full Version looks nice, but loading the pages took forever (10-30 seconds per page). The file labeled printer-friendly seems to be the full-color copy (131MB), and the file not so labeled downloads but won't open because the file "is corrupt or not a PDF" (92MB). Just letting you know. checking this but I've not seen any other reports - have you tried downloading again. the printer friendly version is correct . Weird: I've just tried again, and suddenly it's telling me the non-printer-friendly PDF of the core rules is 156MB, not 92. Apparently, the problem was on my end, though I'd be hard pressed to explain how or why. Anyway, thanks for following up so quickly. Any word on getting a physical copy of this book? Beautiful offset print copies will be in retail in June, and available from Modiphius webstore from May once backers have been shipped. The official printing will be starting soon. Would keep an eye out on your favored retailers over the next few months. EDIT Chris beat me to it. If the quality of their hardback is like that of their Mutant Chronicles 3rd Edition book, I'll be quite happy. Quick Preview doesn't appear to show anything. This is a massive file size, even for this page count. Any hope of getting that down to something more managable in the future? Hi it's two main book files - colour and printer friendly plus map and character sheets. The corebook is 150MB. Large but more manageable than the total 300MB makes it seem. You can download the pdfs individually.